AC induction motor slip calculator - step by step calculation, formula & solved example problem to find the slip of an induction motor. Synchronous & actual speed are the key elements in this calculation. In induction motor, due to its load, the synchronous & actual speed will not be the same, the rotor shaft always rotate bit slower than the sychronous magnetic field. The difference between these two speed is known as speed difference. 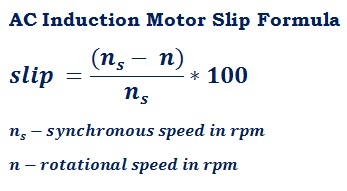 The multiplication of 100 and speed difference divided by the synchronous speed is known as slip of an induction motor. It's always represented in percentage, generally it ranges from 0.4% to 6% based on its design factors. The below step by step solved example problem may helpful for users to understand how the input values are being used in slip percentage calculations. Find the slip of an induction motor, whose actual speed n = 1450 rpm & synchronous speed ns = 1500 rpm. In the field of electrical engineering while designing an AC induction motor, calculating the slip is much important. The above formula, step by step calculation & solved example problem may be useful for users to understand how the values are being used in the formula to find the slip difference & percentage, however, when it comes to online for quick calculations, this calculator helps the user to perform & verify such calculations as quick as possible.